Beat the butter and sugar until crumbly. Then beat in the eggs and vanilla. Combine the flour, baking powder, baking soda and salt in a separate bowl. Add dry ingredients to egg batter alternately with the sour cream. Fold in the blueberries. Prepare a bunt pan by greasing and coating with flour. Spread half of the batter in the bundt pan and sprinkle with 2 tablespoons white sugar combined with 1 heaping teaspoon of cinnamon. Spread remaining batter and sprinkle again with another 2 tablespoons of sugar combined with 1 heaping teaspoon of cinnamon. Get away to the beautiful wine country in the North Georgia Mountains. 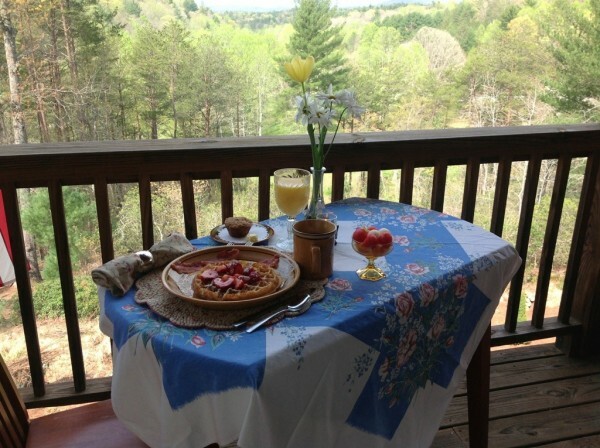 The Lodge offers peace, serenity and classic amenities. Ten minutes from the historic city of Dahlonega. Come and see it for your self.